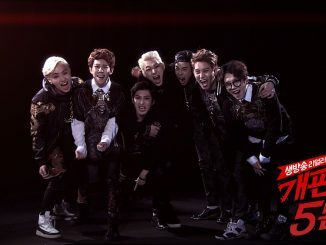 Finally, the official music video (‘Hurray for Idols’) of TimeZ, a six-member global boy group has been revealed! Planned 2 years ago throughout the co-production and co-investment of South Korea’s CJ E&M and China’s Super Jet Entertainment, TimeZ consists of four Chinese members and two Korean members, Mao Ruo Yi (Rapper/Maknae), Liu Guan Xi (Vocalist), Kim Seong Hwan (Vocalist), Tian Yi Chen (Vocalist), Lee Hyeong Joo (Vocalist) and Kong Shu Hang (Leader/Vocalist). Making a successful debut with ‘Hurray for Idols’ through Mnet M! Countdown on October 18th, their debut stage had brought about much joy and laughter when Lee Hong Ki, one of the members from FT Island imitated their key dance move. TimeZ has achieved a rank of 43rd in South Korea and China with the title song ‘Hurray for Idols’, beating down Maroon 5 on the Mnet music chart. ‘Hurray for Idols‘ is a cheerful song with simple melodies and catchy tunes, so make sure you check out the official music video below! [MNET] Join the Superstar K 4 US Star Search Audition!